Campus: Why did you decide to coach? Holko: Well, I played basketball for four years at Westminster College, and I was a history major with a secondary ed [education] minor. I didn’t really want to go into teaching. So my next thought process was that I wanted to get a graduate assistant position, and those are very hard to get into because they are competitive in athletics and difficult to find. So then when I got into coaching, I started off at Misericordia University. But I got into coaching because I didn’t want to leave the sport of basketball. I loved it so much. And I wanted to change lives. You talk to people and they are like, “Well, what do you do?” And I say, “I coach college basketball.” “Well what do you really do?” And, coaching is a lot more than just coaching basketball. I mean, we’re helping these kids figure out a lot about themselves, but through the sport of basketball. And, that’s why I’m in love with coaching. Campus: What is your favorite part of coaching? Holko: I would say building real relationships. Building real relationships within our staff, with our players, getting to really know our players. We are that person for them, so a lot of these girls come in—and we try to get kids from all over to come in here—it’s new for them, and we’re that kind of common area where you can come to us with anything and we’re going to help you. But I would say it’s building the relationships and helping change lives through basketball. Campus: What are you looking forward to this season? Holko: This season, I’m excited. We get on the floor Oct. 15, and that’s going to be my first time seeing a lot of our players since this is going to be my first year here. They had a fantastic season last year. They made it to the conference championship and then fell short to DePauw. We have a lot of young ones coming in with our first-year class, and I’m excited to get back to that conference championship. Campus: Why did you choose to come to Allegheny? Holko: Allegheny sells itself in that aspect. I’m originally from Pittsburgh, and Kate Costanzo, the head coach here at Allegheny, recruited me when I was in high school. I ended up going to Westminster, but there was always a soft spot for Allegheny in my heart. When this position opened, I was in contact with Kate, and I applied just like everybody else did. And once I stepped foot on campus I knew that this was the next place for me. I mean, Allegheny is an amazing place. Meadville is Meadville, but once you’re on campus, it’s a completely different atmosphere. I also think with Allegheny that…the rigorous academics here really help in the aspect of seeing a different side of collegiate basketball. Our kids aren’t just worried about basketball. They have academics, clubs—they’re involved in a lot. Allegheny pushes that, so I think that it’s great for me to see a different aspect of basketball with that. Campus: How long have you been playing basketball? Holko: I’ve been playing basketball since third grade. Didn’t really know much about it. Went to play basketball, came home one day. My mom was like, “That’s what you want to do, well you’re gonna stick with it.” I’m in love with the sport. I played softball as well, but ended up just choosing basketball when I got into travel ball. And then I went on and played four years at Westminster College right down the road. 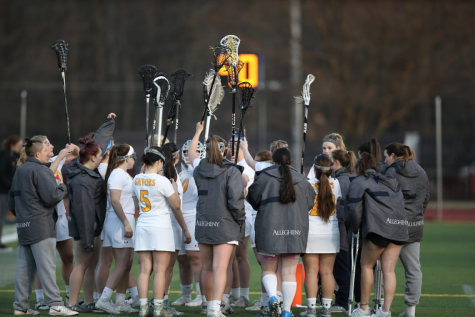 Campus: What do you think are the benefits of playing DIII? Holko: I personally love Division III, and not personally because I had the opportunity to play at it, but the Division III model is just perfect for any student athlete who just wants to make something of themselves besides just playing basketball. With the academics that they have in Division III, it’s higher rigors. It makes them apply more to school and being more well-rounded athletes. But I think that Division III, you’re able to have the same opportunities as Division II and Division I. Yes, you are not on scholarship athletically, but you are able to do everything a Division I and Division II athlete is doing by being involved in your sport four more years. And, it just takes a little more effort academically. Campus: Where were you before Allegheny? 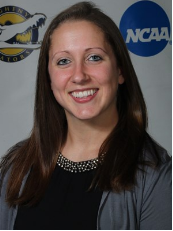 Holko: For the past two years I was the graduate assistant at Misericordia University. It’s a Division III school. We were in the Mac Freedom Conference, and that’s where I got that position as soon as I graduated Westminster. I got into coaching as soon as I was done playing. I had all the opportunities with coaching there, but I also had the opportunity. They paid for me to get my masters as well, in organizational management with a focus in human resources. Westminster, I graduated in 2014. I graduated this last May with my masters, so 2016. Campus: What are your goals for this season? Holko: Win a championship. I know that’s very broad, but having that winning mentality, and coming into a program that has had that winning mentality is something that I’m excited about, and that I’m excited to be a part of. I’m excited to help our girls grow athletically, and be a part of something bigger. I mean, the student athletes we have on our team are—they were—the best of their classes academically and the best of their classes athletically. I think that with the group of kids that we have this year, we are going to be contending for the conference championship. Campus: What traits/characteristics do you believe make a strong team? Holko: I would say the leadership we have on our team is fantastic, and Kate has worked with that. She’s starting her tenth year here at Allegheny, and that’s something that she really believes strongly in. It’s building leaders. We don’t just name captains because you’re a senior. It’s a process, and it’s something that I think really helps with the winning mentality here at Allegheny. I think also that the athletes have helped with having a great team. I mean, they’re putting in work outside of practice and getting in the gym. It’s the dedication they have for the sport and for Allegheny. They know that they have the chance to be a winning team and leave their mark on Allegheny, which I think makes them a great team. Campus: What do you believe the team has to work on the most this year? Holko: The team that went to the championship last year. We graduated five starters, so the leadership is going to be something that needs to be worked on. We are a very young group of young women. We have one senior, two juniors, nine sophomores, and we also have nine freshmen. I believe the leadership is going to be huge with our team, but also just meshing together, and what I mean by that is we just brought in nine new faces, so getting on the same page athletically is always different for any type of team. But I believe that we had a solid group of girls that had a lot of experience last year, and I’m very excited to get on the floor with them. Very, very excited. We have a lot to look forward to this season. I’m just happy to be here at Allegheny. Like I said, Allegheny had a soft place in my heart, and I think that everything comes full circle, and I’m excited to just be here.